DAY ONE 19 Nov ’08 (Wed) – contd. After our incredibly quick visit to the Terrace of the Leper King where we spent just 15 min (compared to the 150+ min we’ve spent at the Bayon), we continued to make haste. I was not sure if we’ll regret rushing thru some of these temples as one of the reasons we skipped “tour packages” is to avoid having to fit into their “rush schedule”. But sometimes we just have to improvise our plan as we move along. And I console myself saying that if need be, we just make another trip back here to cover those temples we missed or that which we rushed. 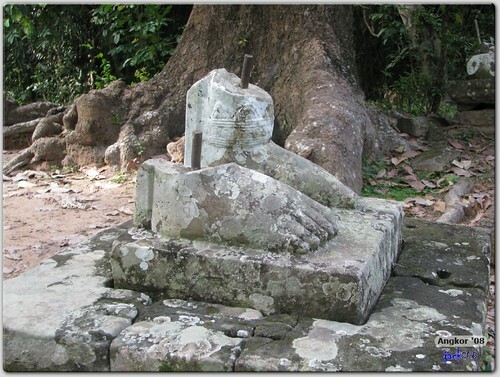 Next on our list is the Tep Pranam; where a large Buddha statue is worshipped. 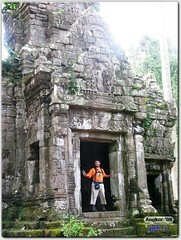 Tep Pranam is located about 100m northwest (refer this post for map) from the Terrace of the Leper King. It’s a relaxing short leisurely walk through the forest. Tep Pranam was built during the era of King Yasovarman so it dates back to the 9th century. 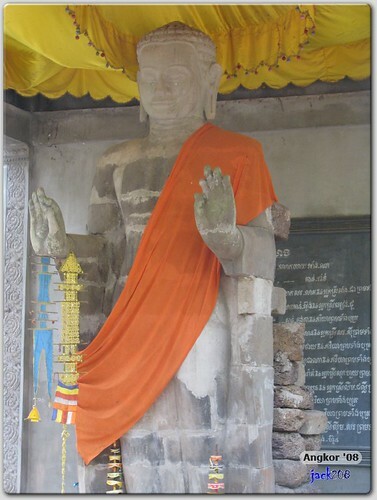 Yasovarman was the king who moved the capital of Cambodia to Angkor. 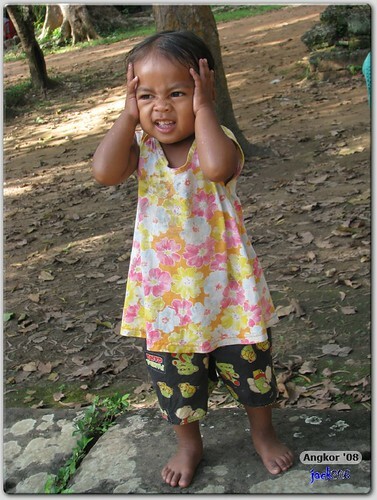 Along the way to Tep Pranam, we passed some villages and saw children playing with abandonment; some watched by the careful eyes of their mothers, most were left to their own. You can see genuine happiness in the eyes of these children even though they seem to lack so much (even clean water & electricity are not easily accessible to them). 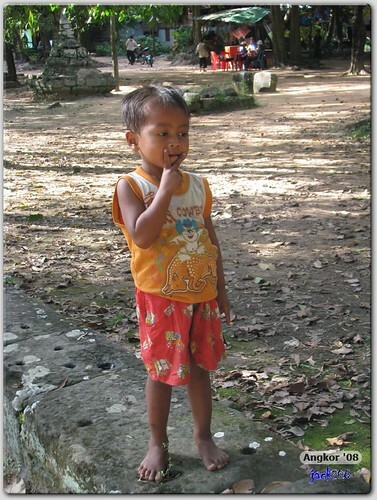 A slipper is probably a luxury for them as you can see (from my photos on Faces of Angkor) most of them go barefoot. Socrates once said, “Contentment is natural wealth. Luxury is artificial poverty.” He described contentment as something you feel you have enough now and you are enjoying what you have, rather than yearning for more. 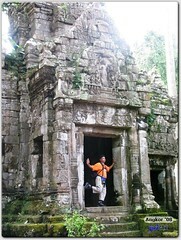 Someone asked me, “So what did you learn from Angkor?” My reply was simply… “Life“. There are so much I’ve seen and experienced from the people of Cambodia that you can’t help but reflect on life in general. 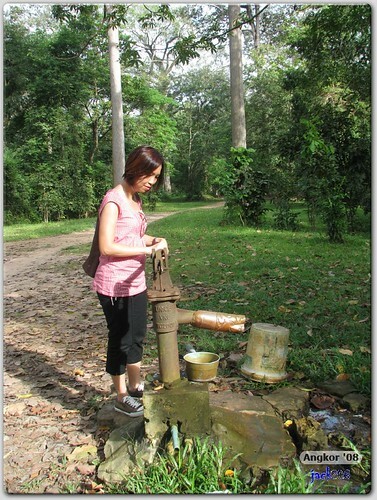 There are many villages like these scattered throughout the Angkor Thom region, and basic necessities such as electricity and water are really hard to get to these people. UNICEF played a role in helping them by building water taps (see below) near these villages to help get clean water to the people staying here. A small effort that I’m sure goes a long way to helping these people live a better life. We finally reached the expansive terrace flanked by two guardian lions and balustrades, and leading to the pavilion at one end where a large Buddha statue was housed. The guardian lions and balustrades are 12th century architecture so this meant they were added on later (likely Jayavarman when he was rebuilding Angkor Thom after liberating Kambujia from the Cham). And now this is where I registered my regret for rushing thru this temple! I didn’t take enough picture of this temple to do a proper blog [cry]. The best photo I’d of the Buddha of Tep Pranam is this close-up shot (above) which does not allow us to see its relative size (it’s huge and about 3-4 times our height). There’s another (smaller) Buddha statue behind the Tep Pranam temple. 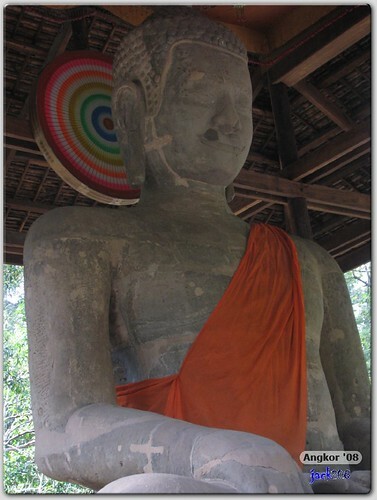 This Buddha is in a standing position and is about 3m tall. 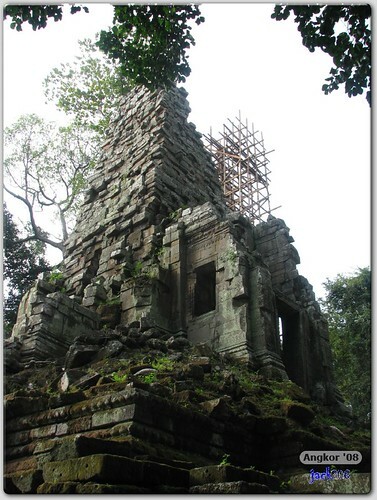 From Tep Pranam, our natural course would take us to Preah Palilay (about 200m from Tep Pranam), a small Buddhist sanctuary that was built by Jayavarman VII’s successor. Since this sanctuary was built using laterite and sandstone, it didn’t withstand the wear of time that well. As you reached the site, you’ll see a terrace flanked on both sides by the seven-headed serpent Naga and their bodies forming the balustrade along the terrace. 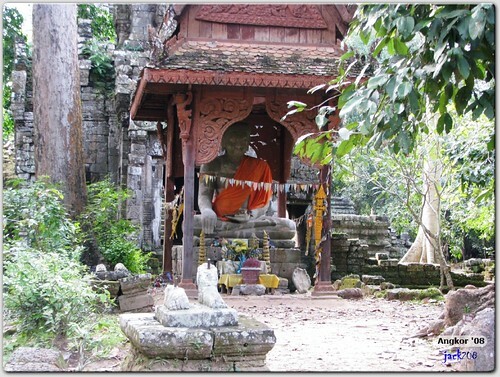 There is also a shrine in front of the Preah Palilay with a seated Buddha. 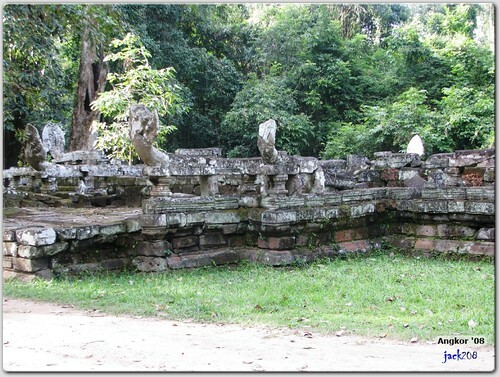 However we were told this shrine is of modern origin and does not date back to the origins of the Preah Palilay sanctuary. 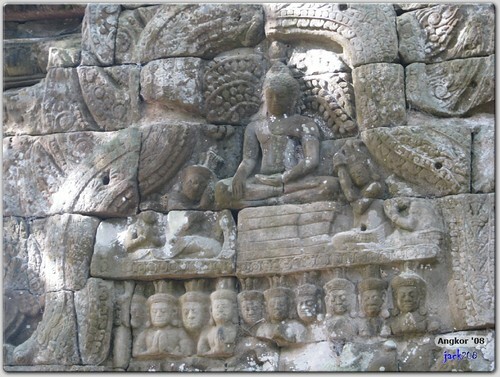 The “modern” Buddha shrine, added in recent times. The most visible structure here is the unadorned chimney-like central sanctuary that stood in the middle of this site. This tower is surrounded on all sites by steps that lead up to gopuras on each cardinal directons. 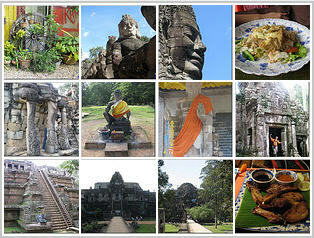 One mystery for this temple revolves around the presence of Buddha carvings here. 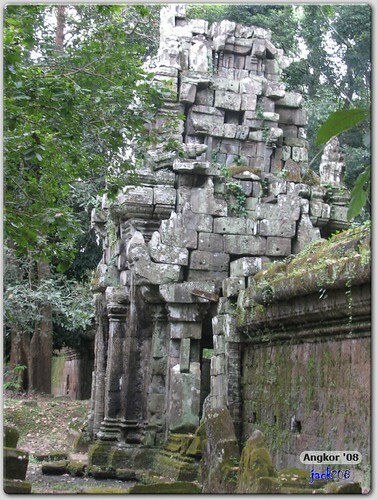 If this was built by Jayavarman VIII then we presumed he would have destroyed or replaced all Buddhist artifacts with Hindu ones. Yet there remains Buddhist artifacts here that seem to co-exist with Hindu artifacts. Note: This didn’t occur to me during our visit on Day One. Only after I’d returned from Preah Khan (where we were searching for remants of Buddhist statues/carvings) and looking at one of the pictures (above) of a Buddhist carvings taken from Preah Palilay, did it occur to me that Preah Palilay seemed to have influences from both Buddhism and Hindusim, and was built by Jayavarman VIII, who was known for destroying all Buddhist artifacts during his reign. We clocked only 15 min for each site and that included the walking time from one site to the next. Not bad as we managed to complete the three sites – Terrace of the Leper King, Tep Pranam and Preah Palilay – within our target of 45 min. 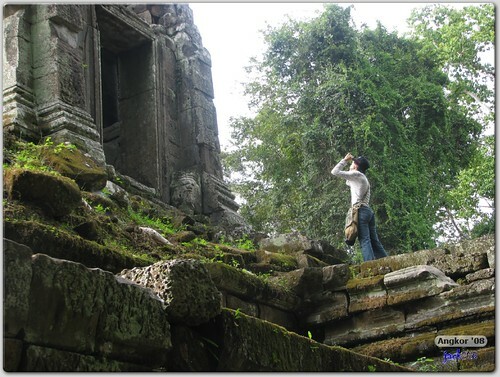 It’s getting late – close to 5pm – and we’ve three more places we would like to cover before we call it a day; the Royal Palace, Phimeanakas and Baphuon. 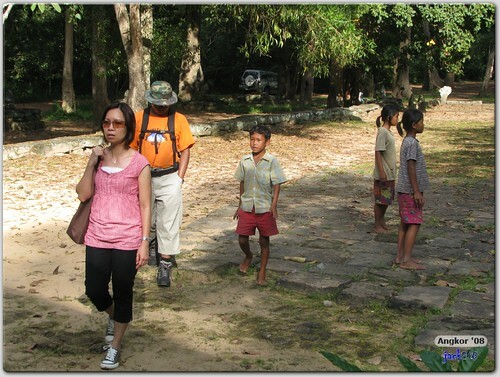 Next is the visit to the Aerial Palace of Phimeanakas, on Day One of our Angkor ’08 trip. Angkor ’08 collection of over 2,300 photos at Flickr.